The PBO-ED-12 Pizza/Bake oven provides 2400 Watts of baking power, fully controllable via an electromechanical thermostat to 550ºF. 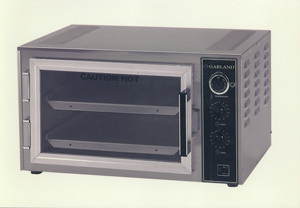 The Garland Group12 Pizza/Bake oven provides 2400 Watts of baking power, fully controllable via an electromechanical thermostat to 550ºF. Two reminder timers allow individual timing of the two bake decks. Ideal for pizza or any baking application, the PBO comes with full view glass door, interior lights, and two high-density aluminum bake decks affording 4in. crown heights. Easy to use, the oven has no fans, blowers or moving parts. The counter top Conveyor Oven, CVO-E-2030 utilizes infrared tubular heating elements-8425 Watts and a solid state thermostat to 650ºF. An electronic heat probe assures balanced top and bottom heat for any product. Fast preheat – room temperature to 500ºF in 5 minutes – means instant recovery. The 18in. stainless steel conveyor belt fits up to 18in. pizzas and features speed control from 3 to 20 minutes. With a footprint of only 21in.H x 28in.W x 30in.D, the conveyor is stackable to three high for maximum pizza production. , 185 E South St., Freeland, PA 18224. Tel: 717-636-1000; Fax: 717-636-3903.